Most of us are at least vaguely familiar with the story of Lizzie Andrew Borden, a young woman accused of killing her father and her stepmother with an axe in 1892 and subsequently acquitted. The murders remain a mystery to this day – while Lizzie was released, no one else was ever accused and she remained the prime suspect, at least in the eyes of the community. Despite being ostracized by her small community, Lizzie refused to leave Fall River, choosing instead to stay there in relative isolation for the rest of her long life, even after her older sister abandoned her. But why would she do that? And how was she acquitted in the first place when the evidence against her was overwhelming? What if there was something larger at play, something too horrible to even contemplate? What if poor Lizzie served as a guardian against some nameless evil set on destroying inhabitants of her small town? "This evil cannot hide from me. No matter what guise it assumes, I will be waiting for it. With an axe." The story is told mainly in first person, from Lizzie’s point of view, with other people’s diary entries, eyewitness accounts, personal correspondence and such inserted between chapters. The story couldn’t have been told as effectively by Lizzie alone. Although they might seem like a burden at first, other characters’ accounts quickly become a welcome addition, providing insight we would otherwise be denied. Maplecroft is researched to the finest of details and extremely well crafted. Cherie Priest is a force to be reckoned with; she has been nominated for many literary awards in the past, including Hugo, Nebula and Locus. I’m sure Maplecroft will easily follow in those footsteps. After all, it is a brilliantly done Lovecraftian horror filled with monsters that provoke absolute dread. It truly is horror at its finest, one that is sure to withstand the test of time. Those of you who are more squeamish should perhaps read a sample first, but true horror enthusiasts like myself have a lot to look forward to. Highly recommended. Even if I'm a bit of wuss I'm extremely intrigued and want to read this one badly! 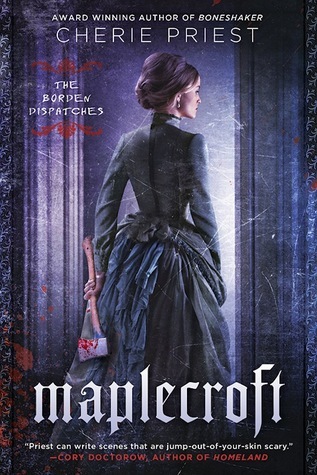 The Lizzie Borden retelling so to speak is just in itself interesting, and having a mix of her POV and added others seem to make for a more complete view! I must get my hands on this one soon! Sounds bloody brilliant. I LOVE retellings of actual events so long as they aren't historically incorrect or set waaay back in the imperial/slavery/whatever days. Plus AN AXE? They're not enough axes in books these days, methinks. Oh this one sounds so good, I keep hearing great things about it and I love the cover. I'm happy to see you had a great time with it, I'll have to read it! soon! But first it will be wishlist. thank you! Yay! I so want to read this! I am so glad you loved it. I am picking it up today! I am absolutely itching to read this one. I have no probelm with horror being a huge SK fan. I must get this ! Woohoo, going to add this to my potential creepy pile for this fall! Glad to see you thought it was successful. This one did make me look twice. Normally Lizzie Borden and villain are synonymous so it's interesting to see how she works as a main character. I'll definitely try the sample first because I'm a bit of a wuss when it comes to horror, but I'm definitely interested. Hm... I am a HUGE wimp when it comes to horror. I've been doing well reading it though. Still, if you say this is for true horror enthusiasts... *ponders* I wonder if I could handle this one. This one sounds very cool! Plus I love her dress on the cover! Yes, I am squeamish but I'm pretty darned excited about this one!! I love that she took the Borden story and turned it on its head. This book sounds great! I'm so happy you introduced it to me, because I had never heard of it before.